The Art of Gelato 2014 the 1st International Annual Children and Youth Visual Art Competition organized by Together In Arts Foundation (Canada), Bruto and Poerio Carpigiani Foundation, and Carpigiani Gelato University (Italy). Its goals being: to encourage children and students to discover and express their inner creativity, to enhance intercultural exchange and communication through visual arts. c) Contestant must be a resident of Italy, Canada, or the USA. 4. Me, my Mom and Dad, and my favourite Gelato cup! 5. Gelato Style – it’s cool! 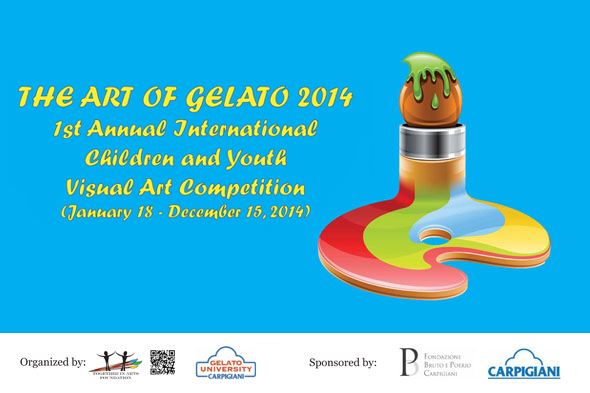 The qualifying works of the first round will be published in “The Art of Gelato” fine art album. It will be promoted and distributed in Italy, Canada, and the USA. The winning works of the second round will continue on to the second round and will be exhibited at “The Art of Gelato” Art Show during International Trade Show SIGEP 2015, Rimini (Italy) in January 2015. There are special nominations and valuable prizes for second round winners with the Grand Prize of “The Art of Gelato 2014” for each group – a week trip to Italy including visiting major museums in Rome, Florence, Milan, and Venice. Click here to download the detailed rules of entry. January 17, 2014 | Filed under Uncategorized @en.